Phillips Talbot, South Asia correspondent of the Chicago Daily during Independence, was an eyewitness to history. 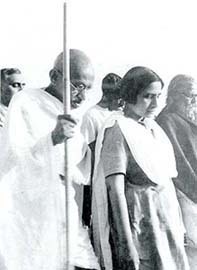 He traveled to Noakhali, West Bengal, and spent time with Mahatma Gandhi during the communal violence there. In a fascinating letter to a friend in New York, he conveyed his impressions of his encounter with Gandhi. Currently president emeritus at the Asia Society, New York, Mr Talbot granted Rediff On The NeT permission to use this letter from his archives in the Freedom section. Two weeks ago I traveled for five days in order to walk for an hour with Gandhi. The journey was worth the effort. It was revealing to watch Gandhi throwing himself during this critical season into the remoteness of East Bengal's Noakhali district for a barefooted village-to-village pilgrimage in search of Hindu-Muslim amity. Here was a 77-year-old ascetic, rising above the physical ordeal, immersed in a peculiarly Indian approach to the cleavage that threatens the country. The region in which Gandhi has secluded himself is deep in the Ganges-Brahmaputra delta; one of the least accessible flat lands of India. To reach his party, I traveled by air, rail, steamer, bicycle, and on foot. Hardly a wheel turns in this teeming, jute-and-rice-growing delta. I saw no motorable road. The bullock cart, one of India's truest symbols, does not exist here. The civilisation is amphibious, as fields are always flooded between April and October. In the wet season little remains above water except occasional ribbons of bund and isolated village clumps marked by coconut palms, bamboos, and betel trees. People stay at home or, at best, move about in hand-hewn skiffs. Though some of their crops grow under water, they farm mostly in the winter dry season. Here, in an entirely rural area about forty miles square, are jammed nearly two and half million people: 1,400 per square mile or more than two per acre. Eighty per cent of these peasants are Muslims. Apart from a few wealthy families they "have nothing but their numbers", in the words of one senior Muslim official. Impoverished cultivators racially indistinguishable from their Hindu neighbors, they suffered severely in the 1943 Bengal famine. The tiny Hindu minority in this region is divided into two groups, of whom the more numerous are also peasants and low caste village artisans. With the upper crust of landlords, moneylenders, grain merchants, and lawyers, peasants of both communities had shared little sympathy for many years past, I judged. In this closely-packed, rupee-starved, isolated district, terror struck last fall in the wake of vicious riots in Calcutta and other Indian cities. It was the first real flare-up in a rural area. Roving bands paddled over the flooded fields from village to village, killing Hindus, looting and burning their property, abducting some women, and registering conversions from Hinduism to Islam. Many of those murdered and robbed were the wealthy who had incurred the peasants's ire in 1943. The movement took a communal twist, however, from politicians (since disowned by the Muslim League) who led the village crowds with the cry of Pakistan. In some villages mobs burned huts even of outcastes. The upheaval swept over about half the district. Perhaps a million people were caught up in the turmoil, and refugees eventually were counted in tens of thousands. This was bad enough. But the effect was multiplied a thousand-fold across the breadth of Hindu India by exaggerated, inflammatory reports of what had occurred. This was the pitch of feeling in India when Gandhi decided to go to East Bengal himself. A few days before he left Delhi, Mildred and I walked with him for half an hour in the sweepers' settlement where he stayed and talked of the wave of mass fratricide which was then rolling over the country. Although he denied letting emotions affect his judgement, we sensed a feeling of frustration, if not of failure. This had nothing to do with the validity of the creed of non-violence itself. Its truth, he repeated, could never be challenged. But he could not be happy with the way in which his teachings were being flouted. To test the applicability of his faith, therefore, he went to the heart of the trouble. He chose East Bengal, and when people asked why he had not gone to Bihar province where the damage was greater and the culprits were Hindus, he replied that the people of Bihar had repented. Besides, he said, he could control the government and people of Bihar from Noakhali, but had no special powers over the people of Noakhali. In a tiny village that suddenly acquired fame, bustling visitors, police attendants, press observers and even telegraph facilities, the old man settled into a hut and began meeting people, hearing their stories and assessing the task ahead of him. 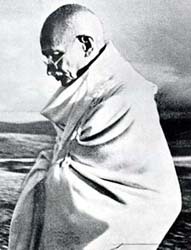 Finally, early in January, he began the trek that will take its place in the Gandhi epic as the East Bengal March. Kind courtesy: New India Digest, a journal to promote a better understanding of modern India. Readers who wish to subscribe to New India Digest may write to India Digest Foundation, Sahaydri Sadan, Tilak Road, Pune 411030.